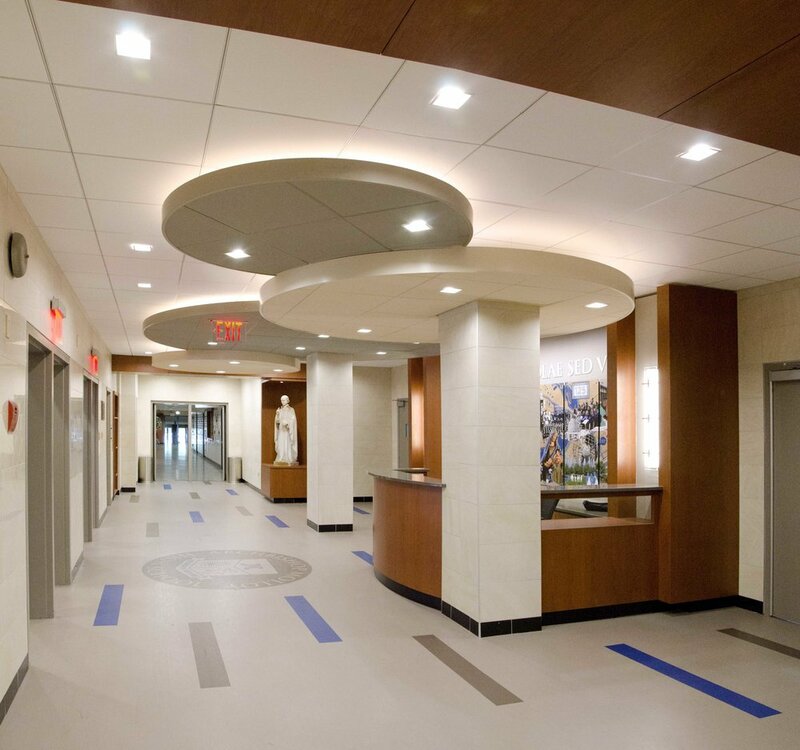 As part of the first phase of a multi-phase building renovation, Tobin Parnes Design was enlisted by Archbishop Molloy High School to reimagine the building entry experience. The program is defined in three parts; the “Building Welcome” with a focus on the entrance and exterior canopy, the “Sense of Arrival” which addresses the entry foyer and “Having Arrived” that includes the lobby area and reception. With the objective of enhancing the visitor experience, a brighter, more modern aesthetic was created, reflecting the spirit of the school. New exterior lighting highlights the building entry from the sidewalk. The entry stair vestibule was redesigned with a greater sense of arrival; flooring was replaced and a brighter wall tile was installed. The new finishes carry through to the main lobby where the school logo is integrated into custom flooring. TPD created dynamic ceiling elements in the form of “floating clouds” that help define the lobby space. A custom designed reception desk, credenza, wall graphics, signage, and new lighting establish a modernized facility. Reflecting the energy of the school, this newly designed common space is shared by students, faculty, and visitors alike.